Helicopter overflight of a fast-moving lava flow emerging from fissure 20 on May 19, at 7:52 AM HST. The flow is advancing to the southeast. Lava fountaining is visible in the background. The audio is the sound of the helicopter. SA 5-20-2018: Presence of andesite means the lava that came up in fissure 17 could have come from magma stored in an underground reservoir dating back to before the 1955 eruption, possibly as early as the 1924 eruption or an eruption in 1840. A small explosion occurred at 12:55 AM at Halema'uma'u crater at Kilauea's summit. It produced an ash plume that reached about 7,000 ft asl and was carried by the wind to the southwest. Additional explosive events that could produce minor amounts of ashfall downwind are possible at any time. Beginning yesterday and into today, the rate of lava eruption has increased. Fissure 17 is weakly active now, and Fissures 16-20 have merged into a continuous line of spatter and fountaining. Flows from the consolidated Fissure 20 crossed upper Pohoiki road late yesterday afternoon and continued flowing southward. This afternoon two flows from the merged fissure complex have joined less than a mile from the coast and continue to flow southward between Pohoiki and Opihikao Rds. The lava flow from Fissure 18 is stalled. It is unknown whether the flows will continue to advance, or stop, and new lava flows are likely given the rate of activity seen at the rift zone. Volcanic gas emissions remain very high. 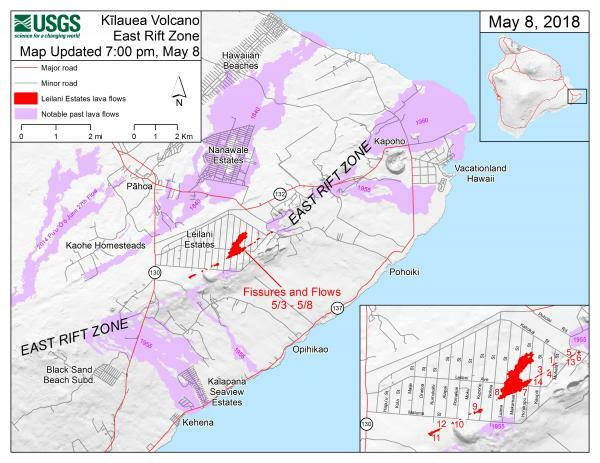 Magma continues to be supplied to the lower East Rift Zone; however, a GPS instrument near the Lower East Rift Zone is no longer moving suggesting that the rift zone is no longer inflating in this area. Elevated earthquake activity continues, but earthquake locations have not moved farther downrift in the past couple of days. Small ash emissions from the Overlook crater have occurred intermittently today. Moderate trade winds were blowing to the southwest and noticeable ashfall may happen in downwind locations. An explosion occurred around midnight last night at Halema'uma'u with the plume extending 10,000 ft a.s.l. Moderate trade winds were blowing to the southwest and noticeable ashfall was reported from downwind locations. At 11:58 PM Local time, a short-lived explosion at from Halema'uma'u created an ash cloud that reached up to 10,000 ft asl and was carried southwest by the wind. Possible trace ash fall may have occurred along Highway 11. Eruption of lava and ground cracking in the area of Leilani Estates subdivision continues. A fast-moving pahoehoe lava flow that emerged from fissure 20 this afternoon continues to flow southeast. The flow has three main lobes. The easternmost is east of Pohoiki Road and is moving about 230 yards per hour. The westernmost of the lobes is near Malamaki Road and is moving at about 40 yards per hour. These rates may change with time and USGS crews are in the area to monitor flow advance. Other fissures remain weakly active and volcanic gas emissions remain elevated throughout the area downwind. Smoke from burning vegetation as lava flows advance is also contributing to poor air quality. 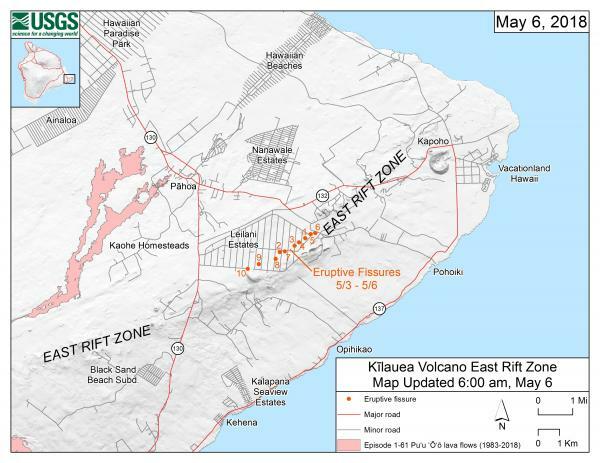 HTH May 18, 2018: "1.86 miles from Highway 137"
Eruption of lava and ground cracking in the area of Leilani Estates subdivision continues. Late this afternoon, a fast-moving pahoehoe lava flow emerged from fissure 20 and traveled southeast where it crossed Pohoiki Road. Estimates from Hawaii County Fire Department aerial video at 6:30 pm indicate advance rate of 300-400 yards per hour; this rate may change with time and USGS crews are in the area to try and monitor flow advance. Other fissures remain weakly active and volcanic gas emissions remain elevated throughout the area downwind. Smoke from burning vegetation as lava flows advance is also contributing to poor air quality. For much of the day, a steady, white steam plume rose from the Overlook vent within Halema'uma'u. Several minor emissions of ash were observed in web cameras. No significant explosions and no earthquakes greater than magnitude 3.5 have occurred in the summit area in the past 24 hours. Background seismic levels have been increasing slowly over the course of the day. Volcanic Activity Summary: At about 0415 this morning, an explosion from the Overlook vent within Halemaumau crater at Kilauea Volcano's summit produced a volcanic cloud that reaches as high as 30,000 ft asl and drifted northeast. Continued emissions from the crater are reaching as high as 12,000 ft asl. At any time, activity may again become more explosive, increasing the intensity of ash production and producing ballistic projectiles near the vent. [Ash cloud] The ashcloud is drifting downwind to the northeast. [Ashfall] Ashfall has been reported in Volcanoes National Park, and may occur further downwind. PHOTO: 1924 Eruption of Kilauea. Ash emission from the Overlook crater within Halema`uma`u has generally decreased since yesterday. Although varying in intensity, at times the plume contains enough ash to be gray in color. The cloud is rising an estimated 3 to 4,000 feet above the ground, but altitudes are varying with pulses of emission. The ash cloud is drifting slowly northward from the Kilauea summit and ashfall may occur in Hawai`i Volcanoes National Park and Volcano Village. Communities downwind may receive ashfall and should take necessary precautions. Several magnitude 3 or stronger earthquakes occurred beneath the summit today. The earthquakes were at shallow depth and resulted in cracks in Highway 11 near the entrance to Hawai`i Volcanoes National Park. Some facilities within the National Park were damaged as well. 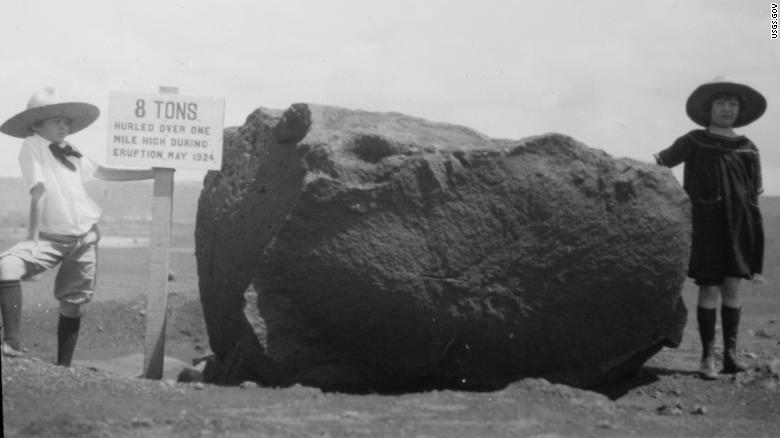 The explosive eruption of 1924 at the Kilauea summit was also marked by hundreds of felt earthquakes as magma drained from the caldera. As deflation continues, strong earthquakes in the area around Kilauea Volcano's summit are expected to continue and may become more frequent. Areas further from these earthquakes may feel some ground motion as well, but much less severe. Volcanic Activity Summary: As of early this morning, eruption of ash from the Overlook vent within Halemaumau crater at Kilauea Volcano's summit has generally increased in intensity. Ash has been rising nearly continuously from the vent and drifting downwind to the southwest. Ashfall and vog (volcanic air pollution) has been reported in Pahala, about 18 miles downwind. NWS radar and pilot reports indicate the top of the ash cloud is as high as 10,000 to 12,000 feet above sea level, but this may be expected to vary depending on the vigor of activity and wind conditions. [Ash cloud] The ashcloud is drifting downwind primarily to the southwest with the Trade Winds. Wind conditions are expected to change in the next 24 hours and other areas around Kilauea's summit are likely to receive ashfall. [Ashfall] Ashfall has been reported in the community of Pahala, at locations along Highway 11 from Pahala to Volcano, and in the Ka'u Desert section of Hawaii Volcanoes National Park. This morning, eruptive activity remained concentrated at fissure 17, with intermittent lava spattering at fissure 18. Earlier this morning, a new fissure (20) located near fissure 18 produced two small pads of lava. The ‘a‘ā flow spreading from fissure 17 advanced about 380 m (1,250 ft) since 2:30 p.m. HST yesterday. The advance of the flow has slowed significantly since yesterday afternoon. At 6:45 a.m. the flow was nearly 2.5 km (1.5 mi) in length. Ash emission from the Overlook crater within Halemaumau has generally increased this morning compared to previous days. Although varying in intensity, at times the plume contains enough ash to be gray in color. The cloud is rising an estimated 3 to 4,000 feet above the ground, but altitudes are varying with pulses of emission. The ash cloud is drifting generally west and southwest from the Kilauea summit and ashfall is occurring in the Ka'u Desert. Communities downwind are likely to receive ashfall today and should take necessary precautions. Earthquake activity in the summit remains elevated with several strongly felt events at HVO today. Most of these earthquakes are related to the ongoing subsidence of the summit area and earthquakes beneath the south flank of the volcano. Deflationary tilt continues. A robust plume of steam and volcanic gas, occasionally mixed with ash, has risen from the Overlook crater within Halemaumau. Over the course of the day, rockfalls from the steep walls enclosing the Overlook crater generated ash clouds mixed with steam and gas intermittently throughout the day. These ash clouds have been relatively low concentration and have risen at most only a few thousand feet above the ground, a few generating very localized ashfall downwind. More explosive activity generating larger ash clouds remains possible and can occur with no warning. This is a Civil Defense Message for Saturday, May 12, 2018 at 7 PM. Hawaiian Volcano Observatory reports a new fissure, number 17, is opening up about 100 meters below fissure 16. At this time, steam and lava spatter activity has started from this new fissure. Minor spattering activity from fissure (16) is diminishing and no significant lava flow was issued from this area. In addition, HVO has cautioned about the possibility of an explosive eruption at Halema’uma’u Crater due to the ongoing withdrawal of lava from Kilauea summit lake. This could generate dangerous debris very near the crater and ashfalls up to tens of miles downwind. Hawaii Police Department is enforcing the Federal Aviation Administration’s Temporary Flight Restriction for lower Puna area. No helicopter or drone activity is allowed without approval. Residents of lower Puna between Kapoho and Kalapana, are advised to be on the alert in the event of possible gas emissions and volcanic eruption. There may be little to no advance notice to evacuate, so take this time to prepare. If you evacuate voluntarily, the Pahoa Community Center and Kea’au Community Center are open. Food will be provided and the shelters are pet-friendly. Thank you for listening. Have a safe day. This is your Hawai‘i County Civil Defense. SA: Residents of Halekamahina Loop Road have been ordered to evacuate this morning after an 18th fissure was verified by the Department of Public Works and police. The Hawaiian Volcano Observatory again cautions the public about the possibility of an explosive eruption at Halema‘uma‘u. This is caused by the withdrawal of lava from Halemaumau’s summit lake, which leads to a phreatic (steam-driven) eruption. Such an eruption could generate ash plumes as high as 20,000 feet. The area affected by ash plumes could be as wide as 12 miles. If this event occurs while you are at home, stay indoors with the windows closed. Turn on your radio and listen for updates from authorities. After the hazard is passed, do check your home, and especially your catchment system, for any impact that may affect your water quality. This is precautionary information for your safety in the event that there is a Halema‘uma‘u explosive event. Hawai’i County Civil Defense wants everyone in the Volcano area to be ready, and to remain safe. Keep yourself informed and on the alert. Volcanic unrest in the lower East Rift Zone of Kīlauea Volcano continues. While no lava has been emitted from any of the 15 fissure vents since May 9, earthquake activity, ground deformation, and continuing high emission rates of sulphur dioxide indicate additional outbreaks of lava are likely. The location of future outbreaks is not known with certainty, but could include areas both uprift (southwest) and downrift (northeast) of the existing fissures, or resumption of activity at existing fissures. Communities downslope of these fissures could be at risk from lava inundation. Residents in lower Puna should remain informed and heed Hawaii County Civil Defense closures, warnings, and messages (http://www.hawaiicounty.gov/active-alerts). Tiltmeters at the summit of Kīlauea Volcano continue to record deflationary tilt. Based on this and field observations of the past two days, the lava lake level continues to drop. Rockfalls from the steep crater walls have generated small ash clouds mixed with white condensed water vapor intermittently throughout the day. These ash clouds have been relatively low concentration and have risen only a few thousand feet above the ground generating very localized ashfall. More explosive activity generating larger ash clouds remains possible. Earthquake activity in the summit remains elevated. Many of these earthquakes are related to the ongoing subsidence of the summit area and earthquakes beneath the south flank of the volcano. High levels of unrest related to the intermittent eruption of lava in Leilani Estates in the lower East Rift Zone of Kīlauea Volcano continue. While no lava was noted erupting today from any of the 15 fissure vents formed thus far, earthquake activity, ground deformation, and continuing high emission rates of sulfur dioxide indicate additional outbreaks of lava are likely. The location of future outbreaks is not known with certainty, but could include areas both uprift (southwest) and downrift (northeast) of the existing fissures, or resumption of activity at existing fissures. Earthquake activity was high in the area today. Continuing ground deformation and located earthquakes were mostly in the area around and northeast of Fissure 15 at Pohoiki Road indicating that the intrusion is migrating further to the northeast. Steaming ground cracks in the vicinity of Highway 130 continue. Tiltmeters at the summit of Kīlauea Volcano continue to record the deflationary trend of the past week and the lava lake level continues to drop. At about 8:32 a.m. HST, a large rockfall from the steep crater walls into the retreating lake triggered an explosion that generated an ash column above the crater; the ash was blown toward the south-southwest. Rockfalls and explosions that produce ash columns are expected to continue. A 3D model of the Overlook crater was created from thermal images collected during an early afternoon helicopter overflight on May 8. Based on the 3D model, the lake level was about 295 m (970 feet) below the floor of Halema‘uma‘u Crater. Volcanic Activity Summary: The steady lowering of the lava lake in “Overlook crater” within Halemaʻumaʻu at the summit of Kīlauea Volcano has raised the potential for explosive eruptions in the coming weeks. If the lava column drops to the level of groundwater beneath Kīlauea Caldera, influx of water into the conduit could cause steam-driven explosions. Debris expelled during such explosions could impact the area surrounding Halemaʻumaʻu and the Kīlauea summit. At this time, we cannot say with certainty that explosive activity will occur, how large the explosions could be, or how long such explosive activity could continue. Residents of the Kīlauea summit area should learn about the hazards of ashfall, stay informed of the status of the volcano and area closures, and review family and business emergency plans. Primary hazards of concern should this activity occur are ballistic projectiles and ashfall. During steam-driven explosions, ballistic blocks up to 2 m (yards) across could be thrown in all directions to a distance of 1 km (0.6 miles) or more. These blocks could weigh a few kilograms (pounds) to several tons. Smaller (pebble-size) rocks could be sent several kilometers (miles) from Halemaʻumaʻu, mostly in a downwind direction. Presently, during the drawdown of the lava column, rockfalls from the steep enclosing walls of the Overlook crater vent impact the lake and produce small ash clouds. These clouds are very dilute and result in dustings of ash (particles smaller than 2 mm) downwind. Should steam-driven explosions begin, ash clouds will rise to greater elevations above ground. Minor ashfall could occur over much wider areas, even up to several tens of miles from Halemaʻumaʻu. In 1924, ash may have reached as high as 20,000 feet above sea level. Small amounts of fine ash from these explosions fell over a wide area as far north as North Hilo (Hakalau), in lower Puna, and as far south as Waiohinu. Gas emitted during steam-drive explosions will be mainly steam, but will include some sulfur dioxide (SO2) as well. Currently, SO2 emissions remain elevated. Steam-driven explosions at volcanoes typically provide very little warning. Once the lava level reaches the groundwater elevation, onset of continuous ashy plumes or a sequence of violent steam-driven explosions may be the first sign that activity of concern has commenced. Kīlauea’s lava lake began to drop on May 2, 2018. From its peak on May 2 to the most recent measurement at 9 pm on May 6, the lava lake surface dropped a total of more than 200 m (656 ft). The subsidence was at a relatively constant rate of about 2 meters (yards) per hour. Measurements of subsidence have not been possible since May 6 because of thick fume and the increasing depth to the lava surface. However, thermal images indicate continued lowering of the lake surface since that time, consistent with deflationary tilt recorded at Kīlauea’s summit. Therefore, we infer that the lake surface continues to drop at roughly the same rate. So, while HVO cannot report exact depths of the receding lava lake, we can monitor the overall trend. USGS and HVO scientists are monitoring changes at the summit 24/7 and watching for signs that hazardous conditions have increased, or may increase. 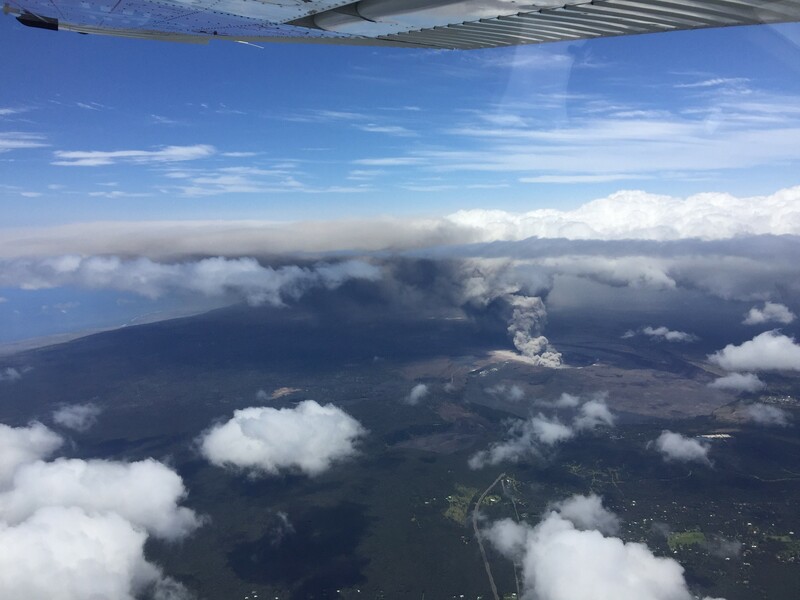 HVO is working closely with Hawai‘i Volcanoes National Park and Hawai‘i County Civil Defense to respond to this situation. The intermittent eruption of lava in Leilani Estates in the lower East Rift Zone of Kīlauea Volcano continues. Activity today was focused on the northeast portion of the fissure area; two new fissure segments (13 and 14) broke ground between fissures 7 and 6. Fissure 13 cut across Leilani Street. By 5:00 pm, fissures 13 and 14 were inactive; late this evening geologists reported loud jetting and booming sounds, and some spattering, at fissure 13. At about 6:00 p.m. reports of booming sounds were reported in the vicinity of Black Sands Beach Subdivision. When HVO geologists arrived soon after, no such sounds were occurring. Earlier this morning, geologists reported the widening of cracks of about 1 to 4 cm (0.4 to 1.6 in) of cracks on Highway 130 and Ali‘ili road. Rates of seismicity changed little throughout the day, but increased during the fissure activity in the afternoon. Gas emissions remain elevated in the vicinity of fissures. HVO field crews successfully completed the installation of two new co-located seismometers and GPS receivers on the north and south sides of the East Rift Zone. Mahalo to landowners for allowing access and use of their property. HVO geologists will be in the area overnight to track and report to Hawaii County Civil Defense on the activity, and other scientists are tracking the volcano's overall activity 24/7 using various monitoring data streams. Tiltmeters at the summit of Kīlauea Volcano continue to record the deflationary trend of the past week and the lava lake level continues to drop. Rockfalls from the steep crater walls into the retreating lake continue to produce occasional ashy plumes above Halema‘uma‘u crater. These plumes are expected to continue. The intermittent eruption of lava in the Leilani Estates subdivision in the lower East Rift Zone of Kīlauea Volcano continues. The location of activity today was focused on the southwest portion of the area. This morning, two new fissure segments broke ground. The first (fissure 11) opened in a forested area southwest of Leilani Estates about 9:30 am and was active for only 3 hours. The second (fissure 12) opened about 12:20 between older fissures 10 and 11. By 3:15 pm, both new fissures were inactive but the west end of fissure 10 was steaming heavily. Cracks on Highway 130 widened from 7 cm to 8 cm over the course of the day and additional cracks were found just west of the highway on trend with the eruptive fissures. Rates of seismicity and deformation changed little throughout the day. Gas emissions likely remain elevated in the vicinity of fissures. HVO geologists will be in the area overnight to track and report to Hawaii County Civil Defense on the activity, and other scientists are closely tracking the volcano's overall activity using various monitoring data streams. Tiltmeters at the summit of Kīlauea Volcano continue to record the deflationary trend of the past several days and the lava lake level continues to drop. Rockfalls from the steep crater walls into the retreating lake continue to produce occasional ashy plumes above Halema‘uma‘u crater. These plumes are expected to continue. Earthquake activity in the summit remains elevated but has decreased over the past few days. Many of these earthquakes are related to the ongoing subsidence of the summit area and earthquakes beneath the south flank of the volcano. This message will be updated tomorrow morning or earlier should conditions change.